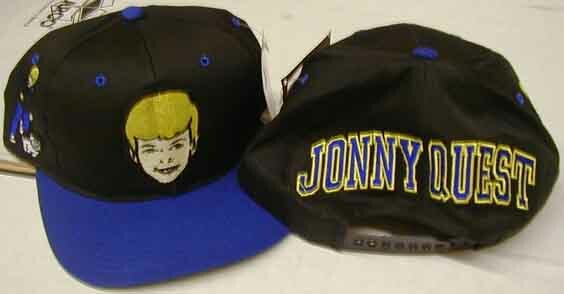 In 1964-65, during Jonny's initial prime-time run, P.F. Flyers ran a promotion that included a TV commercial featuring our hero rescuing Race Bannon from the side of an erupting volcano, with the help of their trusty magic decoder rings (and their P.F. Flyer shoes, of course). All you had to do to get your own ring was buy the shoes, and send for the ring! Pretty cool stuff! 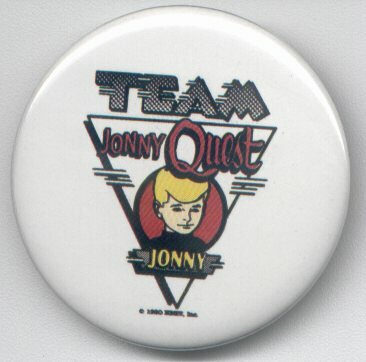 Even though the ads said "just like Jonny Quest uses on his TV show" this was a pure marketing ploy, as the ring never was seen on an actual episode. Of course, that didn't stop kids (including myself) from pestering our parents endlessly until we got the ring (oh, yeah, and a new pair of nice white sneakers, too). 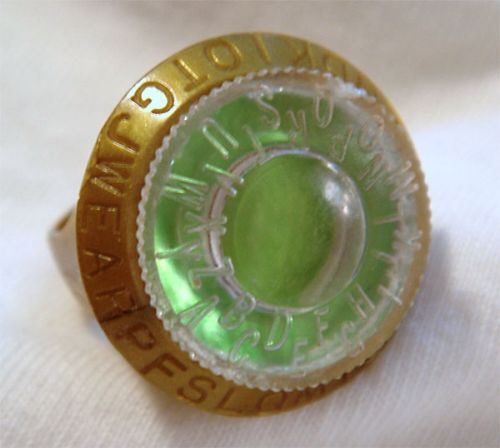 I do remember getting the ring (you had to send away for it) and using the letter wheels to write secret messages (mostly to myself; I don't think any of my friends had one). The top opened up to reveal a secret compartment. See more info and images, including a look at the instructions that came with the ring, and some advertising item images. And here are the actual layouts for the commercial! The image on the left is from the Van Eaton Galleries internet site. They were asking (at the time) $US 95 for the item; other watches from the same edition appeared for a time on auction sites like eBay, typicallyselling for $US 40-45. 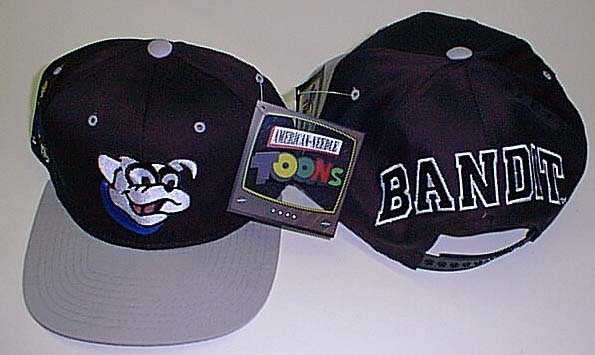 The image on the right is from the collection of Dan Johnson. Click on image to see a larger image of the watch inside its collector case which looked like a TV entertainment center. This watch was a limited production item; only 2,500 were made. 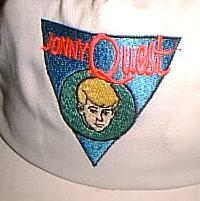 The image above is from the collection of Dan Johnson, and shows another Classic Jonny Quest watch. 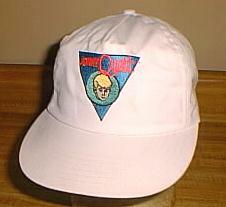 It was part of the promotional materials for the 1996 VHS releases. We think these neckties were sold in the Hanna-Barbera Employee Store in the 1990s. 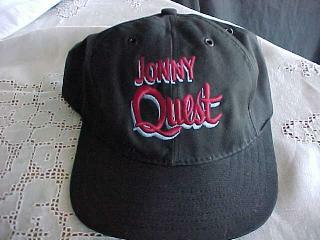 This was purchased in a Warner Bros. store in the fall of 1998; copyright 1996, made in China. 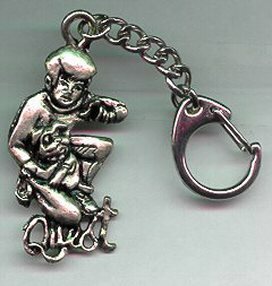 Silver-plated keychain features Jonny and Bandit in classic kneeling and pointing pose. Figure part measures 2 inches tall by 1 & 1/4 inch wide. Pin is same pose, about 1-1/2 inches tall and wide, manufactured in 1993 by Zanti, Ltd., now discontinued. 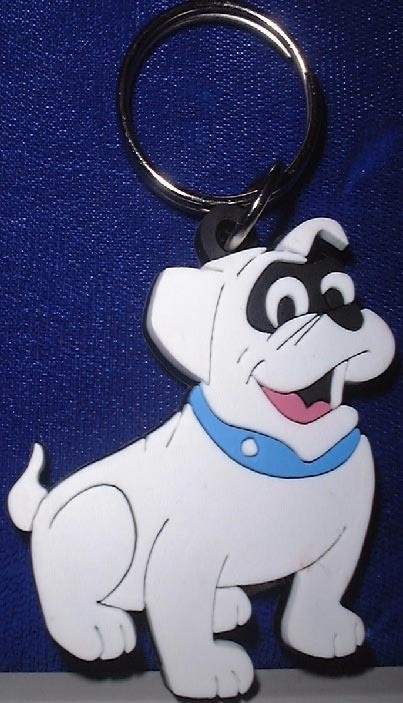 About 1-3/4 inches in diameter, this pin was available as part of a promotion with the original release of the VHS tapes from the Cartoon Network.